Background: Permanent abdominal wall closure in patients undergoing damage-control laparotomy is achieved using techniques involving separation and advancement of abdominal wall components along with surgical mesh. However, these techniques are costly, morbid, and time-consuming. We compared outcomes following permanent abdominal closure using component separation (CS) with non-cross-linked porcine acellular dermal matrix (PADM) versus temporizing split-thickness skin graft (STSG) closure. 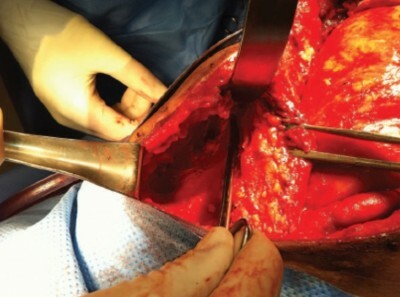 Materials and methods: A retrospective review identified eleven patients who underwent damage-control laparotomies from January 2010 to June 2011. Outcomes assessed included hospital length of stay (LOS), days on ventilator, size of defect and tissue matrix, and postoperative functionality. Results: Of the eleven patients identified, primary closure was achieved in five, CS/PADM closure in four, and STSG closure in two. Those with primary closure were excluded from the study. In the CS/PADM group, large defects (>24×20 cm) were successfully closed using CS with PADM. Patients in the CS/PADM group had reduced third-space fluid loss, less difficulty in managing the open abdominal wound, and decreased risks for potential enterocutaneous fistulae, and intra-abdominal abscess formation. Total hospital LOS and days on the ventilator were also significantly reduced in the CS/PADM group compared with the STSG group. Conclusion: Early abdominal closure using CS/PADM was safe and effective in these patients, and may be cost-effective because only one operation is required. The shorter hospital LOS and days on the ventilator observed versus STSG closure appear promising, although further study is required.